The Millennium Development Goals (MDGs) on maternal and child health are lagging far behind target. Although Africa has just 12% of the global population, it accounts for half of all maternal deaths and half the deaths of children under five. In Tanzania, attendance at prenatal clinics is over 94% but only 50% give birth at proper health facilities. It is not like in the United States where giving birth at home is a matter of choice. In our part of the world, women are unable to reach proper medical help at their most vulnerable time. I was born under the hand of a traditional birth attendant and I grew up healthy and strong to become the President of my country. It is my hope that we can provide the same opportunity to every child. Once, when I was a Member of Parliament, I was visiting a village out in the countryside when I witnessed first-hand the very problem that we are trying to address. As I was examining a local farm, I noticed four people on the nearby road struggling to place a huge basket on top of a bicycle. It appeared from a distance to be quite a difficult task. I continued on with my meeting but as we drove back into town, we passed these same villagers only a few kilometres from where I had originally seen them. We stopped to see if we could offer any help. What we found was that the large basket on top of the bicycle contained a woman in labor. In fact, she had been in labor for three days and was not able to deliver. This woman's family was attempting to transport her 28 kilometres to the nearest health centre on the back of a bicycle because she was unable to walk. I decided that those of us who were passengers would give up our seats so that this woman and her family could reach medical help as quickly as possible. As I waited on the side of the road for our car to return, I worried for this woman and I contemplated what might have happened to her and her unborn child. Our car returned and we made our way to the city where we met up with the woman and her healthy new-born baby boy. I was relieved that this woman was no longer in danger and this woman was so relieved to have a healthy son that she gave him my name. This story reminds me every day of the unnecessary pain that so many women suffer and why we have made maternal health a top priority. It is unacceptable to allow mothers and children to die when we have the knowledge and resources to save them. Governments in Africa have taken it upon themselves to invest in healthcare. When I came into office in 2005, healthcare was the 6th largest budget expenditure and now it is the 3rd largest after infrastructure and education, which indirectly have a relationship with health in one way or the other. Maternal health and child health are at the top of the list. But we are governments of poor countries. There is a scarcity of medical personnel in Africa. The ratio of doctors to patients in Tanzania is 1:25,000 and the ratio of nurses to patients is 1:23,000. While the ratio in the United States is 1:300. Our government has taken serious measures to address this shortage of health professionals by increasing enrolment in health colleges. In fact, enrolment has increased fourfold over the past three years. In 2007 there were 1,013 students attending health colleges and now there are 6,713. Our goal is to reach 10,000 students by 2015. Though global maternal deaths are in decline and women's health has at last become a global priority, our goal of reducing maternal mortality by 75% in 2015 is still a long way off . Women and children are still dying needlessly. We must continue to invest in training for doctors, nurses, facilities, and increased health proficiency and demand more of ourselves than ever before. We must also educate and provide the tools necessary to combat malaria deaths. The majority of malaria victims are pregnant women and children below five years of age. 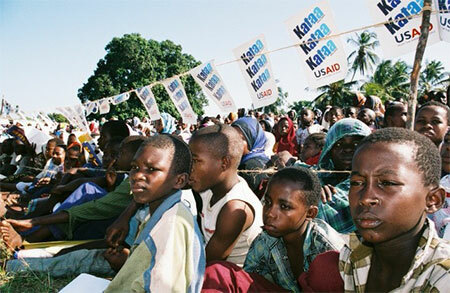 In fact, children under the age of five account for 90% of the approximately 60,000 malaria deaths in Tanzania each year and pregnant women that contract malaria have a high risk for complications. That is why I have started a new anti-malaria campaign named "Malaria Haikubaliki" which translates to "Malaria is not acceptable" and seeks to promote awareness and increase measures to protect against the disease. Last year, the United Nations General Assembly launched the Global Strategy for Women's and Children's Health and already over $40 billion has been committed to this initiative. The Global Strategy calls for the support of all stakeholders in order to enhance financing, strengthen policy and improve service delivery for the most vulnerable women and children. This means supporting country-led health plans through sustainable investment, integrating health delivery services so that women and children can have access to medical attention whenever needed, and providing stronger health systems with skilled health workers. 85,000 more quality health facilities and up to 3.5 million more health workers available. I am proud to co-Chair the Commission on Information and Accountability for Women's and Children's Health, along with Prime Minister Stephen Harper of Canada in order to establish a framework to monitor global commitments for maternal, new-born, and child health and ensure committed resources save as many lives as possible. It is critical that all partners translate their commitments into action. In order to meet our goals, we must track resources and meet commitments, providing transparency, credibility and efficiency. All of these efforts must be supported by a unified, global accountability structure. High-income countries must maintain their commitments and low- and middle-income countries must continue to invest in their own health infrastructure. It is my goal to make sure that we stay focused on the core objectives of maternal, newborn, and child health and that we provide stakeholders with a consolidated framework to take coordinated action. Low-income countries will continue to shoulder the greatest burden of maternal and child mortality but I believe that our work will set a renewed momentum and focus to accelerate progress towards reaching the objectives of Millennium Development Goals 4 and 5 by 2015. Jakaya Mrisho Kikwete is the President of the United Republic of Tanzania.